Well, our 50th Class Reunion has come and gone, and I think everyone that attended will agree that it was definitely a great success. We got to see and talk to a lot of classmates, some we had not seen since High School. A total of 97 classmates and former classmates attended at least one of our weekend events, along with their guests. Prizes were awarded thoughout each event, thanks to the generosity of the local community (and the hard work of Lou Sharpe) - from free coffee/ices/pizzas to free breakfasts/dinners and flowers. On Friday morning, thanks to Dan Fleagle's organization, there was a golf outing at the Waynesboro Country Club - three foursomes total. Apparently they all had a great time. Didn't get a report on "winners"? Maybe nobody wanted to tell? On Friday night, 98 of our classmates and their guests gathered at The Rolling Mill (the old Varsity) in Rouzerville. We had the place jam-packed and overflowed onto the outside patio. Meat and cheese trays, along with vegetable and fruit trays and dips kept us well fed. A cake with a picture of our High School and Class of '60 Banner was provided by Sally (Weikert) Rowe, one of the Committee Members. Due to a "senior moment" by the committee, classmates had to "hunt the classmates" that belonged to the nametags they were given - kind of like a treasure hunt! To bring back memories of Waynesboro in the '60's, a lists of establishments, a lot long gone, was compiled and on the tables to jog our memories and generate conversation of the "Good Old Days", There were also a lot of pictures loaned to us from the Historical Society showing Waynesboro in bygone days. We had a lot of catching up to do with what was going on in our lives. Ten door prizes were awarded. On Saturday morning, some of the classmates took advantage of the tours - one to The Waynesboro Industrial Museum on Philadelphia Avenue, with locals Bill Helfrick and George Buckey as guides to answer any questions we may have had. There were original patents from Geiser Manufacturing, Frick Company, Landis Tool and Landis Machine, as well as very unusual patents by local entrenpenuers - a tricycle with an old reel-type lawn mower for back axle, and a bicycle with a wind sail attached? We then toured the Oller House (now the Waynesboro Historical Society) on West Main Street. Our guide there was Doug Stine, a local historian. Beautiful old architecture and very unusual shower (forerunner to modern day shower with spray from all sides) in the bathroom. They also had a display of Victorian dress that some of us girls would have liked more time to explore - just not a guy thing. There were 157 classmates, former classmates and friends at the Country Club on Saturday night. We had registration and social hour from five to six, and some were actually there by 4:30. Thanks to lots of hard work by the Committee, each classmate was presented with a "Yearbook" which included our original yearbook pictures, along with current information on our lives (and some of us had a lot to share), reunion details, committee members, deceased classmates, our monthly class events and special recognitions . This updated information will all be posted on the Website in the near future. Background music of our times was provided by Bill Kipe from his collection over the years. Ninety classmates were there, along with two guest teachers, Mr. Robert Cutchall and wife, and Mrs. Rose Dillner and husband, when the picture was taken by Pictures Plus, . Entrance to the dining room was through an archway of blue and gold balloons, and tables were decorated with blue and gold balloon centerpieces. Invocation was given by Bill Kipe. A delicious buffet dinner, along with salad, desserts and drinks was served. Welcome was by Pam (Bonebrake) Ray, Committe Chairman, and special comments by our Class President, Tom O'Shea. Randy Beamer, Sally (Weikert) Rowe and Pam (Bonebrake) Ray conducted a Memorial Service to honor the 32 classmates that have passed away since graduation. Prizes were awarded to Kenny Hovis for first classmate reservation for Saturday night, Bob Morris for the 50th (50 Years), John Pentz for 60th (Class of '60) and Carmen Rowe for traveling the farthest to attend (Gilroy. CA). An additional eight door prizes were awarded. Two framed prints were raffled off. One of The Dipper by Landis Whitsel was won by Doris (Mackey) Stoner, and one of the Welty Bridge in Winter by Henry Biesecker, was won by Linda (Stevens) Fitz). A beautiful clock was presented to Pam Ray, Committee Chairman, and a gold embroidered royal blue throw was shown that will be presented to Linda (Smith) Stoops, who served as Committee Chairman for so many of our previous reunions. Art Guyer took pictures throughout the evening and forwarded these to the Committee. These, as well as some taken by other classmates, will be posted to the Website shortly. On Sunday morning, the last day of our Reunion Weekend, 73 classmates, family and friends enjoyed a buffet breakfast at the Savoy Resturaunt on North Church Street - again, lots of good food - and we still found a lot to talk about. An additional eight door prizes were given out. 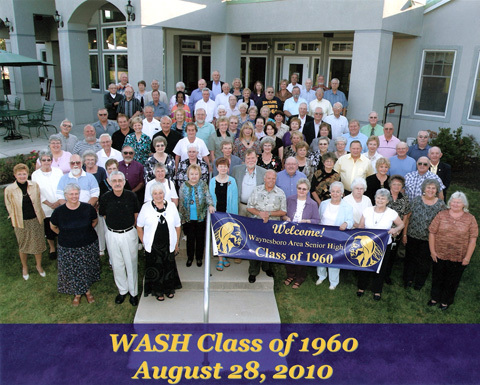 As a wrap-up to our very special Reunion Weekend, we had a champagne mimosa toast to our remarkable WASH Class of 1960. Toastmaster was Luther Sharpe. After breakfast, about a dozen of us toured the new addition and remodeled areas of Waynesboro Area Senior High School - nothing like our old school. We also walked down to the Cupola/Amphitheatre area between the Senior High and Middle School - new home to the Cupola off of OUR High School. On Sunday afternoon, several of our classmates attended the Jazz Festival at Renfrew Park. A special recognition was made to Judy (Robson) Pearson's family in honor of her recently deceased brother, Pete, who was such a staunch fan of their festivals over the years. All in all, we had a very busy, and quite special weekend, have gotten a lot of very positive feedback, and know that we, as a Committee really had a great time. We hope everyone who attended agrees.